Story update: The two cooling towers at the Brayton Point Power Station in Somerset, Mass., are scheduled for implosion April 27, 2019. SOMERSET, Mass. 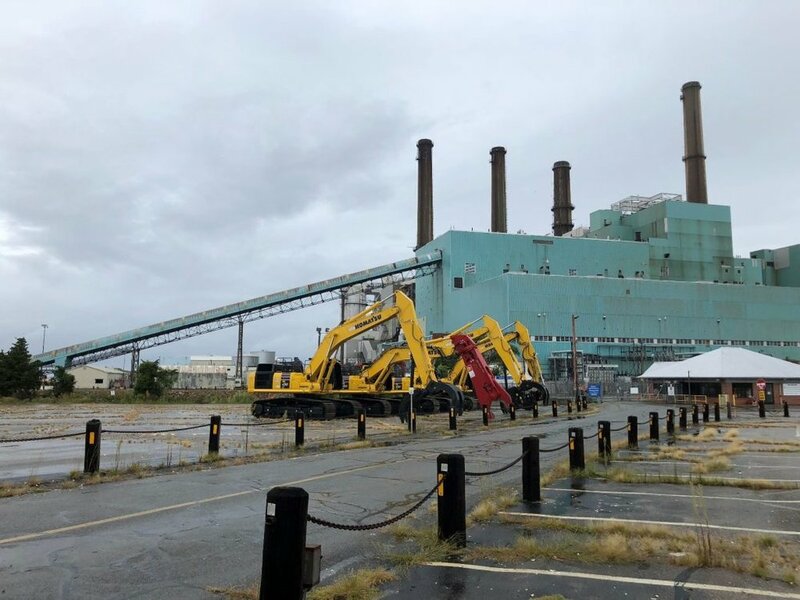 — The Brayton Point power plant isn’t likely to burn coal ever again as demolition is underway to level the former fossil-fuel facility, including its two 500-foot-high cement cooling towers. On Sept. 25, the owner of the 307-acre peninsula on Mount Hope Bay received permits to raze the pollution emission stacks and the cooling towers, which are often confused for nuclear reactors. According to the town’s building commissioner, Paul Boucher, the owner of the property, Commercial Development Company Inc. (CDC) of St. Louis, has a permit to level the site within three years. As of Sept. 28, oil storage tanks were being dismantled and asbestos abatement was underway. The 1,530-megawatt Brayton Point Power Station was New England’s largest coal-power facility and a regular on the Toxics Action Center’s “Dirty Dozen” list of polluters. The plant opened in the mid-1960s and closed May 31, 2017. The owner at the time, Dynegy Inc., based in Houston, blamed the closure on low natural-gas prices. The facility’s opponents and energy experts speculated that the cost of pollution-control upgrades and protests contributed to the plant’s shut down. According to the Environmental Protection Agency (EPA), emissions from the Brayton Point Power Station were responsible annually for 32 deaths, 61 heart attacks, and 472 asthma attacks in surrounding counties. The power plant was blamed for warming upper Narragansett Bay. Save The Bay sued the EPA to enforce pollution-control efforts. In a settlement, then-owner Dominion Energy agreed to build the cooling towers for $507 million. They were completed in 2012. Save The Bay said the heated water, or thermal pollution, discharged from the power plant into Mount Hope Bay caused environmental damage. At its peak, a billion gallons of heated water was pumped daily into the Taunton River and bay, contributing to an 87 percent decease in fish such as winter flounder and other aquatic diversity. John Torgan, state director of The Nature Conservancy Rhode Island Chapter and former baykeeper for Save The Bay, said the goal was never to close the plant, but to bring it into compliance and protect Mount Hope Bay. “And I think we achieved that. It was the boom in shale gas that made the plant no longer economical, not environmental regulations. That said, it is fitting that the towers are coming down."